You might remember a certain ship that encountered a little buoyancy trouble back in 1912. So much for being ‘unsinkable’. As claims go, that’s no less far-fetched than Vauxhall’s proclamation that the Corsa GSI can take on the Ford Fiesta ST.
That’s the same Fiesta ST that not only ran away with our sister title Parkers’ Best Car for Thrill-seekers gong, but scored the overall Car of the Year award. While the Fiesta packs a 197bhp warbly three-cylinder delight under its bonnet, the Corsa makes do with a paltry 148bhp from its bland 1.4-litre four-pot. Despite this, Vauxhall’s horses appear to be more Shetland Pony than Shire Horse, with the GSI being slower to 62mph than the 123bhp Audi A1 1.4 TFSI Sport Nav. Don’t think that there’s no way you could afford an Audi either – it’s noticeably cheaper to finance than the Corsa. And it has nav as standard – a £650 option on the Vauxhall. 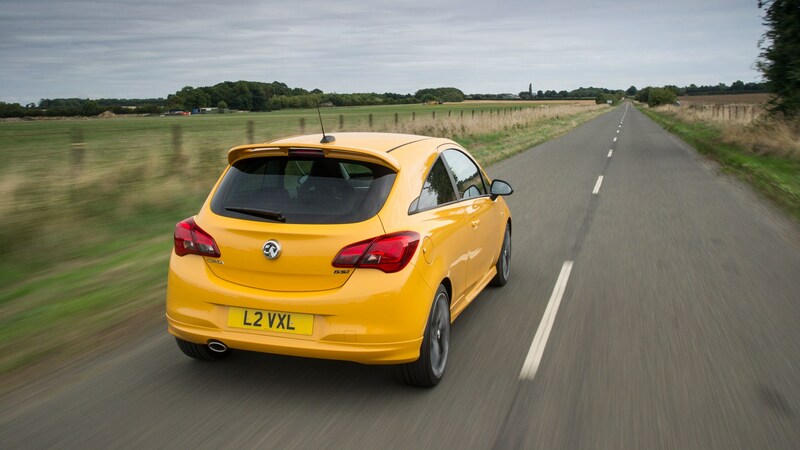 You might be struggling to understand what the Corsa GSI is for; Vauxhall claims it’s designed to be quick, safe and agile, offering a VXR chassis with greater efficiency. Helping to back up those claims, the GSI sits on Koni FSD suspension, devised to boost comfort, while maintaining suitably sharp handling. As for efficiency, claimed economy stands at 47.1mpg – identical to the Fiesta ST, despite the Ford offering a third more power. That means that while the GSI requires 8.9 seconds to accelerate to 62mph – that’s slower than a 318d – the Fiesta takes just 6.5 seconds. What’s the Vauxhall Corsa GSI’s engine like? With better high-rev breathing and 148bhp to punt around a supermini, you’d expect the GSI to be suitably rapid. If you’re used to a 1.2-litre Corsa then you won’t be disappointed, but our test model didn’t feel particularly energetic. The car we drove had just 700 miles on the clock, so it’s possible it will loosen up with a few miles, but it didn’t leap off the line with the enthusiasm you’d expect a £19,000 supermini to offer. Peak power comes in at a low 5,000rpm, not far above the peak torque, which starts at 2750rpm and lasts until 4500rpm. Whether it’s our version’s low mileage or the car itself, the GSI feels lethargic at lower revs, with that torque figure failing to fire the Corsa down the road as keenly as you’d hope, and the engine feels a little flat across the rev range. That sense of a strangled engine extends to the noise it makes – there’s no ST-style thrum. Nothing particularly sporty here. The gearbox is similarly middle-of-the-road. It’s fine, but it’s neither the slickest nor most satisfying, with the Ford again offering more satisfaction through its gearbox. 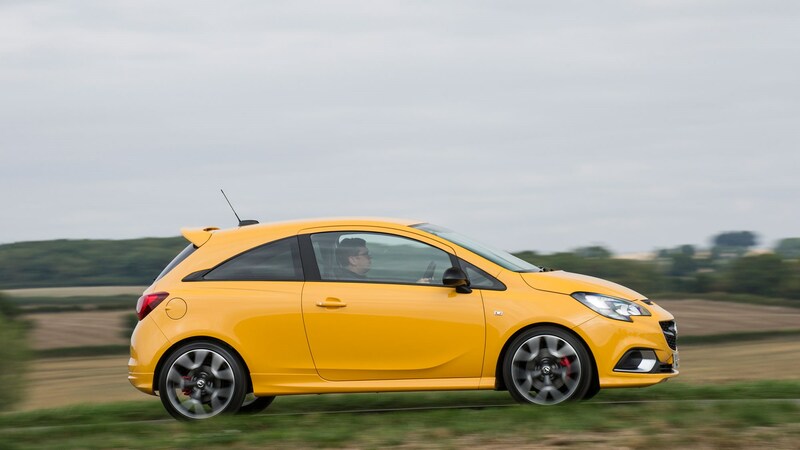 How well does the Vauxhall Corsa GSI handle corners? With trick Koni FSD suspension, the Corsa GSI is suitably firm, but smoothly damped over bumps. Encounter a corrugated stretch of tarmac and it does struggle to contain the car’s movements and distance passengers from the road, but it is a definite notch more compliant than the Fiesta ST.
That firmness keeps the Corsa quite planted on the road, with the front tyres reasonably well keyed into the road surface. It’s not particularly sharp, however, and the Fiesta ST is infinitely more satisfying to take down a twisty road. Even a 140hp ST-Line Fiesta offers a greater feeling of connection to the road, too. Traction isn’t a problem even in the wet, but then with 50hp or so less than the Fiesta ST, the Corsa is hardly overly taxing its front tyres. The steering is well weighted, providing a reasonable sense of confidence in bends, but again, the Fiesta ST is miles more engaging, giving you much more confidence – and should be able to take said bends much faster, should the mood take you. What equipment is standard on the Corsa GSI? You get air-conditioning, a heated windscreen and cruise control, plus 17-inch alloys, sports seats and a touchscreen media system in this Vauxhall – though navigation will cost you. Sadly, the Corsa lacks kit that is included with the mid-spec Fiesta ST-2, even though it’s the Ford that is cheaper to finance. That includes Recaro seats – they’ll set you back £1,055 in the Corsa – plus climate control, heated seats and a 10-speaker B&O sound system. How costly is the Corsa GSI on PCP finance? At launch, monthly payments for the Vauxhall stand at £295 per month compared with £288 for the Fiesta ST-2 (for a 36-month PCP deal with a £2,000 deposit and 10,000-mile-per-year allowance). That compares with £270 per month for a MINI Cooper S 3dr and £264 for the Audi A1 1.4 TFSI 125 S Line Nav (both with the same contract details). Step down to a Fiesta 1.0 EcoBoost 140hp ST-Line – which offers very similar performance to the Corsa – and that figure falls to £250 per month. Yes, that’s a 148bhp Vauxhall Corsa for dramatically more per month than a 189bhp MINI. So, should you buy one? Er, no. The Corsa GSI is outclassed for value, speed, handling, equipment and it’s not even a new car anymore, dating back to 2014. It’s also down on equipment compared with its deadly rival – the Fiesta ST.
There’s nothing wrong with the Corsa GSI, it’s just so far off the pace of several faster, more desirable alternatives that you have to absolutely love the Vauxhall brand to spend so much on an outclassed and ageing Corsa.